Thanks for posting this. I've become a bit reluctant to start up a new drama lately, for fear it will fail at the end. It don't know why it seems so rare for a drama to have a good ending.... (Also, I'm tired of love triangles and silly miscommunication incidents that could be easily cleared up if both people in the couple just talked to each other for a minute. Hmmm.... maybe I haven't been watching the right dramas lately!) Anyway, I'll have to try "Romance is a Bonus Book"! Have any of you guys seen "Healer"? Wow, Ji Chang-wook was kind of a revelation in this. Other than a few rare moments, I think his acting was perfect. And... he is extremely good looking.... I tend to be a sucker for these types of action/spy series, so this was right up my alley. Park Min-young's character was cute and peppy at all the right times while still being a believable human being, and I absolutely loved her relationship with her adoptive father. Yoo Ji-tae was great as the mysterious, slightly suspect benevolent figure, and I liked the relationship between his and Ji Chang-wook's characters. The storyline was twisty enough to keep me interested and there was enough emotional weight in what was going on to keep me invested in all the characters. I actually ended up buying this series so I can watch it again. Just the highlights for me in where the new programs rank, I won't include everything. Sorry for the wall of text. Once I got started, I couldn't stop myself. FS Seimei -- I love the power and thrill of his skating in this program, and the choreography is really interesting. This was the first program of his that I really, deeply fell in love with. The step sequence at the end always gets me fired up. Favorite performance: Olympics 2018. It may not be a flawless performance, but this is the one I feel the most, with the way he fought for it and the beauty of all his movements. Romeo & Juliet V1.0 -- I like the choreography and the music for this program a lot, and I love his sit-spin twizzles. Favorite performance: Nice 2012. The raw passion and talent is so obvious, and this particular performance was so mesmerizing. The first time I saw this, I gasped out loud at that moment he fell, because I was so lost in his skating it was almost a shock to the system. And then his scream before the step sequence... chills! Hope and Legacy -- H&L is an opaque program to me. What that means is that it feels undefined, there is no obvious story or emotion to it, and when he skates it he seems remote from the audience. Some of his other programs draw you in, but H&L does not for me. Instead, it feels like a dance he is performing for himself, like a mad skating god dancing on a hidden pond, and we just happen to be hiding in the bushes watching it. It is captivating and beautiful, and yet distant somehow. I don't know how to describe how I feel about this program; hopefully that makes sense. Favorite performance: Of course Worlds 2017. Origin -- Origin is brilliant and fascinating and full of fiery power and remote fury, maybe like that mad skating god raging at us for spying on him, lol. I love what we've seen so far (although I mourn the loss of the sit-spin twizzles...). But particularly the 4T-3A, which may not give him the most points from a technical standpoint, but damn it looks beautiful and I love it! I would put Origin higher but I just don't feel like we've seen it to the full extent of its beauty yet. It may be an unpopular opinion, but I would like to see it come back next season just so he can perfect it. Although I will still stand by what I said in the other thread: that it feels like it should be a performance piece instead of a competition piece. Favorite performance: Worlds 2019. SP Otonal -- My new favorite SP, and maybe my favorite program of his ever. Every movement is important to building the overall feeling of the performance, and the step sequence is gorgeous, particularly the movement from low hydroblade to soaring ballet jump. That is my favorite moment of choreography ever. Favorite performance: Rostelecom 2018. While I like the music cut from ACI better because it generally fit the choreography better, I think I like the overall performance at Rostelecom the most. He is beautiful and so smooth in his presentation, and the step sequence has been changed slightly into one that flows much better. Chopin Ballade No. 1 -- This one is almost up on the same level as Otonal, just not quite. What more can I say about it? It is just... breathtaking. The choreography might as well have been created at the same moment as the music itself, it fits together so well. Favorite performance: Olympics 2018. I love how frenetic he is during the wilder moments of the music, during his step sequence. It's like he just becomes the music. Exhilarating! Parisienne Walkways -- I love this because he doesn't do enough of this kind of program: swaggering, rock-star-level charisma over the ice and over the audience. It's just awesome. Favorite performance: Olympics 2014. He looks like he is having so much fun. I can't help but grin like an idiot watching this performance, and it's just flawless from beginning to end. EX Notte Stellata -- I cry watching this one. It is truly beautiful. His delayed axel is so gorgeous! Enough said. Favorite performance: All of them. Haru Yo Koi -- This one is just below Notte Stellata for me. It is also truly beautiful and touches my heart. My favorite moment is the ice thrown into the air, although the super-low hydroblade is lovely too. And the delayed axel! 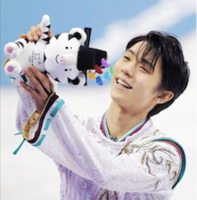 Favorite performance: Helsinki 2018. Something about this performance is special to me. The lighting is gorgeous, and he floats across the ice like a cherry blossom fairy. The only thing is I wish they had drawn the camera back a bit more for when he throws the ice into the air, but that detracts nothing from his joyous and ethereal performance. Just look at that expression on his face at the end! Finally had a chance to see some of the other programs besides the top three, and I just wanted to say I still really love Kevin Aymoz's free program. I've loved it ever since ACI. It looks like he made some changes to it, and it is a shame he fell on the 3A and missed his combination (although maybe he should get points for rebounding so fast... seriously, he was down one moment and up on his feet the next ). He also looked really nervous and almost uncontrolled at times, which made his skating look a bit wild. But wow, what a step sequence. I still really love it, especially after the changes. It is so unique and interesting, and it builds nicely with the music at the end. Definitely a memorable program, even if he didn't perform it as well as he wanted. Or maybe I love it because of the balletic jump. I've been obsessed with those this season, mainly because of Otonal. All programs should have one, I think. My favorite part of this is when Brian and Ghislain put their fists up in the final pose too. They're respectful, and they're very smart, because I'm sure every premium seat was throwing gifts on behalf of the rest of the audience. Yes! I was thinking this same thing while watching it today. It has such powerful imagery in its brilliant choreography that it feels more like a performance than a competition piece. It feels wrong somehow to have it shown on competition ice, with all the blazing lights. It needs some shadow and some mystery to really capture the feeling that is being created. Otonal's still my favorite, probably even my favorite short of his, period (that step sequence is so brilliant, and even a popped jump or two doesn't take away from how beautiful the whole thing is!!). But Origin has been growing on me and I'm ecstatic he was able to perform it clean today. I really think decreasing the amount of time for the free skate was a mistake on the ISU's part. That extra time is what is used for extra choreography and breathing time, and without it, most of the free skate programs feel even more like jumping competitions now. Even Origin feels in some way like he's just skating quickly back and forth between jumps, and we're talking Yuzu here, with all his wonderful transitions and step sequences and choreo. No wonder so many other skaters have even less interesting programs, because everyone's just frantically trying to get the next jump in to be able to survive in the BV competition. Maybe some of the other rule changes will benefit the sport in the long run, but I think the time decrease is not going to be one of them. Let's not even talk about the judging.... Some of you guys mentioned Javi commenting on the judging. Do you guys have links for that? I'd love to hear what he has to say about the judging in this particular competition. I wish I could read Japanese novels. I read some Japanese and have been working to improve my understanding, but a full book is beyond me at the moment. I wish I understood more, because there are so many books by Japanese authors that never see an English translation. I'm impressed and envious that you can read in both (even if English books are a chore for you). The biggest factor for me is the kanji.... Fantasy, sci-fi, and classic literature are my favorites too. I need to get "The Lord of the Sands of Time", that looks interesting! I feel the same way, Wonn (your pictures are exactly how I am feeling!!). I've been looking forward to seeing him in person since I bought the tickets in February, and now.... I'll still go to GPF, but it just won't be what I was hoping for. I don't have a lot of spare cash, so flying somewhere to see him will probably be out of reach for now. That's why I was ecstatic that he was going to be coming to a place only a few hours away from me. I should have known it was too good to be true!!! Now I'm trying to figure out where I could possibly see him compete live, and I've got no clue. He'll probably be at Worlds in March, right? But that's an expensive plane flight away and I'm sure all the tickets for that have been snatched up. Will I have to wait until next season? Ugh, it's so tragic, his season was shaping up to be another 2014-2015 record-breaker, and I wanted to be there for it. I also really wanted to see Otonal live...... Crying bunnies everywhere! I can understand that, because that's how I feel reading Hardboiled Wonderland. It is the mixture of the mundane and the bizarre that throws me off, I think. Like in Wind-Up Bird Chronicle, I could not feel invested in the bizarre stuff because he would bring the story jolting back into the real world with what felt to me like overly detailed descriptions of the mundane, such as cooking ordinary meals. My imagination would be wound up with the strange girl and the story of the man in the well, and suddenly I have to read (what felt to me like) tedious paragraphs about his normal life. To be honest, I don't know why I had such a hard time with that book. I tried it multiple times, gave up the first time, and finally muscled through the second time. It just didn't grab me, and I wanted to be grabbed like I was when reading Hardboiled Wonderland. Maybe I should try his non-fiction. And I still want to read Kafka on the Shore... I started it awhile back but Real Life intruded and I haven't picked it back up again. But that one did have the "grab" from what little I read, so here's hoping that maybe I'll add that to my tally of Murakami Books I Love. I just finished Stranger on Netflix (비밀의 숲 or "Secret Forest" is the literal name per Wiki). I found it extremely good, with a tight pace and a lot of characters that I ended up growing to like. The relationship between Si-mok Hwang and Yeo-Jin Han was perfect: two highly intelligent people who respect and trust each other and end up having a delightful camaraderie throughout the series. I would happily watch them sit and banter over dinner for a full episode, I think. I loved Yeo-Jin in particular. She was awesome! I liked how most of the characters ended up being sympathetic in some sense. Yeo-Jin says at one point that there are no black and white people, but shades of grey, and this series really plays to that quote. Even the main villain was a character whose point of view I could understand (and even kind of respect to a point) while still fully agreeing with Si-mok's declaration that the villain is a "monster". Overall, I really enjoyed it and would recommend it! I was too! I thought the same thing for a moment. Stop worrying us, Yuzu! Oh, you're right! I missed those hand gestures before. I knew he would be directing them! Thanks for the links to this! I think this is my favorite medal ceremony ever, even despite poor Yuzu on his crutches. Yuzu continues to be so respectful to his competitors and to fans, and Kazuki Tomono and Morisi Kvitelashvili were really kind and helpful. 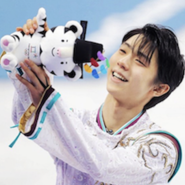 I was rather impressed that they both reached out to help him up, and then Kazuki commandeered his flowers and gift and took the time out of his own moment of triumph to get them off the ice for Yuzu, and Morisi helped Yuzu down from the podium too. Such a great display of sportsmanship on all sides. It really warms my heart to see it. (On a side note, what cruel ISU official hands a guy with crutches two bulky objects to carry, and then ditches him on his own to try to shuffle back? I know it's all tradition, but surely they could have arranged to have someone standing on the side after the photos were done to take the flowers and the gift back to the boards for him... and kinda too) Also, at first I thought Yuzu was directing Kazuki and Morisi with his crutch (because for a moment they didn't look like they knew what came next after they got their medals and left the podium) and was thinking "that is so like him ", but from a different angle it's clear he was communicating with the photographers. No matter, I bet in his heart he was probably urging them to go ahead and do their victory lap.